Many Government officers, including the police, would rather take the bullet than admit to corruption charges, but not one Superintendent of Administration Police Gitahi Kanyeki. Kanyeki is breaking this ground by speaking the truth, which he believes would eventually set the force free. And it is all in a social website, the Facebook. He is charting unfamiliar territories for the Disciplined Forces who have been accused of all manner of ills, including leading corruption indices. Kanyeki is puzzling many in his crusade for a corrupt free force by facing the public and confessing openly he has, in the past, taken bribes. “Let us confront the hard facts. The nation is crying for change but nobody wants to change himself,” he says. He says lives of police officers are full of tribulations, not because they were born to suffer, but because of curses they receive from those who bribe to have justice. The superintendent says he has resorted to using the social websites such as the Facebook to reach a wide audience. He posts videos of himself addressing gatherings in official uniform. “It is hard to have an officer in uniform confess to public that he has taken bribes,” says the 45-year-old officer. Kanyeki says he took the bold step after realising most Kenyans extol the virtue of being honest but none was courageous enough to admit engaging in corruption. “So many of us say corruption is bad but very few are bold enough to confess it when involved,” he says. In the Internet videos, the officer introduces himself as a police officer and urges colleagues and the public to be honest to win the fight against the vice. “I used to take bribes. It is evil and a cancer that kills eventually,” he says. Kanyeki, who was the Molo Commandant before being transferred to Administrative Police headquarters in Nairobi as Staffing Officer One at the operations department, says the last amount he took, as a bribe, was Sh500. The bribe, he says, was to allow a woman to transport some firewood out of a forest. “From then I have resolved not to take bribes again in my life,” he states. He now warns all that corruption does not help and comes with curses from the giver. He says those who receive bribes, keep spending the cash on unending life problems. “Corruption is the worst source of money in life. It is cursed money and all those solicit bribes die poor,” he says. He says when he started the campaign many officers who condoned the vice shunned him, but they have eventually seen the value of his message. He says he was moved when he, and other officers under his command, visited an old woman whose livestock had been stolen in Molo. They found the granny on her knees, praying to God to punish the thieves. He says it was not only the woman who aggrieved but also her only child and a cat next to her who all benefited from the cattle. “This moved me because I knew for the thief to evade arrest, he must bribe an officer somewhere. I thought of the crying child, the kneeling woman, the cat, and their suffering touched me,” he explains. Kanyeki’s efforts to fight corruption and change the image of the force have earned him recognition. Last year during Jamhuri Day celebrations, he was awarded the Head of State Commendation and this year he scooped the 2009 overall best officer in innovation. 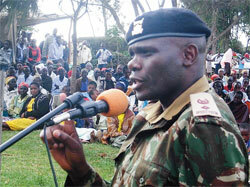 He was also awarded for his role in promoting peace in Molo during the post-election violence in 2008. “The two major communities in the region were too hostile and we had to device ways of diffusing the tension,” the officer recalls. He and other officers in Molo organised peace meetings with the locals and with time, they appreciated their role in bringing communities together. The commandant, who joined the forces as a musician in Brass Band in 1984, calls on the public to help change the image of police force instead of just branding them corrupt, cursing or viewing them with suspicion. “There are good officers in the force and the rest must change. It would be very difficult to answer a child who demands to know why you extorted bribes from innocent people during your retirement days,” he warns. Kanyeki says his campaign has paid off, especially at his former station in Molo. None of my officers has been implicated in the embezzlement of the Internally Displaced Persons cash but other Government officials in the region have, he says.